This article is about the battle stage in Mario Kart DS. For the town in Paper Mario: The Thousand-Year Door, see Twilight Town. Twilight House, in Mario Kart DS. Twilight House in Mario Kart Wii. Twilight House is a battle course in Mario Kart DS. The house is located at the center of a forest during twilight, floating above a dark void. The course has eight wide rooms surrounded by a narrow balcony, with an inaccessible ninth room at the center of the home. Players can fall to the void if they run along the balcony, especially on the 90 degrees turns. Some Dark Shine Sprites can be seen over the walls of Twilight House. 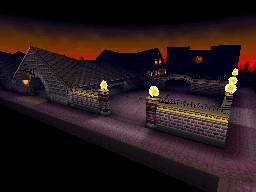 Its name may been inspired by Twilight Town from Paper Mario: The Thousand-Year Door. The course reappears as a retro battle course in Mario Kart Wii. The course was updated with ambient lighting, better shading, and remixed music; however, the biggest change is that a thick forest filled with trees (similar to Moonview Highway) was added below the course where players can fall into, with tall pillars now holding the house up. In Mario Kart Wii, the Twilight House had a tournament. The battle course was changed into a race track, and players competed in a 5-lap grand prix race for the fastest possible time. The tournament was restricted to the Wii Wheel option, and was the 2nd tournament for July 2008. It was later repeated as the 2nd tournament for July 2010, with the exact same restrictions. Mario Kart Wii European website: "Weave in and out of a spooky house, taking care to stay away from the edge as you battle against the backdrop of a spooky red sky." EodukeomKEOM! Pun on "어두컴컴" (eodukeomkeom, meaning "darkness") and "come"
This page was last edited on April 25, 2019, at 17:31.